Hi beautiful! Hope you're day is going good. As mentioned in my February Favorites, I've been loving UV nail polishes for the past few months. I love having my nails done at all times, and coming across this polish, which is pretty much indestructible, has been amazing! I feel like this deserves a little blog post for itself simply because it lasts for about two weeks, and looks fab. The range of colors available for shellac at my nail place is pretty limited so I haven't tried out too many. My favorite one however, is definitely "Decadence" which is the one I'm wearing in the pictures shown above. It's this gorgeous deep red wine color. I've had this color a few times and I adore it. Another nice red is called "Wildfire" which is more of a lighter, orangey toned red. I also like "Gotcha" which is a really pretty nudey pink color (not as bright as it appears in picture below). In my opinion, the pro's outweigh the con's, but this is because the shellac holds really well on my nail type. As mentioned, my cousin (and two other friends of mine) cannot wear this for more than a few days as it peels off, so either it will be a major hit or a miss. I recommend trying it and see how it holds! :) I don't think I'll go back to wearing regular nail polish any time soon because it's a hassle when it chips after just 1-2 days. My uber stylish mom (who does dishes every night) loves it too :) I hope they come out with some new colors soon! Thank you for your advice, Annie. On me regular nail polish lasts about two days, I will definitely try this out. I really like the fact, that you did not only list the pros! Have you read the post? because she explained all there. It'll take a few minuets that will be worth it! You can actually buy more colors on Amazon and take them into your salon for them to apply :) Tutti Frutti is a gorgeous bright pink and Zillionaire is a clear glitter which looks gorgeous over white, beige, or light pink nails! That colour looks great on you! I used to use shellac but since being vegan I haven't as I don't know if it is vegan. I also worry about the chemicals involved. I definitely think how long they last is amazing though! Love the necklace !! where is it from ? Love your necklace ! where is it from ? 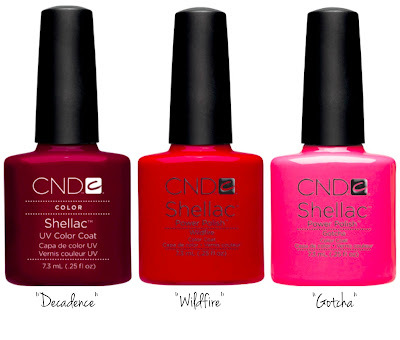 I also am a huge shellac fan - the con of it being expensive is what made me purchase the lamp and do them myself! It cost $100 on Ebay and came with 8 colours - I love it!! And with the uv lamp at home, you can actually use your own nail polishes and just use the base and top coat and cure it under the lamp as you normally would, it makes the nailpolish last just as long! You have such great taste in nail polish colours! which are your favorites from OPI & Essie?? Hi Annie! I also LOVE Shellac and cannot ever go back to normal polish. Some salons have more options than others...I dont know how devoted you are to your salon. A salon I recently discovered in my area has tons of shellac colors! OPI, Essie, and a brand called "Gelish" are carried there. I prefer the OPI or Essie because I feel like they last longer and I love their colors. Enjoy your pretty nails! I used to live by these manicures too. I really think you should watch this video http://www.doctoroz.com/videos/ugly-truth-about-gel-manicures-pt-1 I found it after googling some issues I was finding with the gel and shellac manicures I was getting. You should investigate more on gel nails, and try not to use them as much. UV light is not good for you. That is why we wear sunscreen and UV light is used to purify things. Check the intensity of it. I absolutely LOOOVE shellac! Im going to get mine done tomorrow! I have tried a few colors, but my favorite by far is just simple french tips:) I love how shellac protects your nails so well while its on, and it lets my nails grow like crazy, because they're brittle when they're bare. Taking it off yourself can cause some serious damage if you don't know how to properly remove it, and that's the only con for me. They have so many colors. Order them on Amazon (for $11 - $12) and take it to the salon with you. They usually charge less for your manicure and after a few applications it pays for itself. Or you can do it yourself, we have a post on our blog about it but basically its my favorite thing to do. I go every few times to the salon to get my cuticles done and the "spa" treatment of a manicure but in between I always do my own. My nails chip very easily, especially since I wash my hands a lot. I definitely need a polish that will last longer than a day.... :( I like the red one you have on. Very classy. Look nice. I am a big fan of gel nail polish and love red color. It lasts 3-4 weeks without chipping. I've got one of the gel polish kit at Runway Professional. Its really nice and perfect for me. I strongly recommend checking them out.